At least 30 suspected al-Qaeda militants have been killed by an air strike in a remote mountainous area of Yemen, security officials say. An unnamed official told reporters the strike took place as dozens of militants gathered in Shabwa province, east of the capital, Sanaa. Two senior al-Qaeda commanders in the Arabian peninsula could be among the dead, he said. Al-Qaeda has carried out frequent attacks in Yemen in recent months. The Saudi government has recently expressed its concern about the resurgence of the movement in the region. 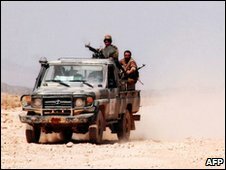 AFP news agency quoted the security official as saying Saudis and Iranians had been at the suspected al-Qaeda meeting. "We are still unsure if two of the top leaders have been killed or not," Reuters news agency quoted him as saying. "One of them is the Saudi al-Qaeda member Nasser al-Weheshi." Another official told AFP that the suspected militants had been meeting to plan terror attacks in Yemen, in retaliation for Yemeni military air strikes carried out last week. Reuters news agency cited a security official saying that a radical Muslim preacher linked to the US army psychiatrist charged over the fatal shooting of 13 people at a US army base was suspected to be among those killed. Yemen-based al-Qaeda sympathiser Anwar al-Awlaki, who was released from a Yemeni prison last year, and Maj Nidal Hasan had exchanged e-mails before the shooting at Fort Hood last month, US officials say. Last week, Yemeni officials said they had killed 34 suspected al-Qaeda militants and arrested 17 in operations in Abyan province in the south and in Arhab, north of Sanaa. Officials said the militants had allegedly been planning multiple suicide attacks, with eight of them preparing explosive vests at the time of the raids. Analysts say Yemen, the ancestral home of al-Qaeda leader Osama Bin Laden, has long been an ideal base for jihadists. With its rugged mountains and traditionally weak central authority, it is terrain well suited to militant groups looking for hiding places and training camps. The US has given nearly $70m (£44m) in military aid to the Yemeni government this year, the Associated Press reports, as it seeks to better equip Yemeni forces for the fight against al-Qaeda militants.